Seattle’s job boom may be making headlines, but new data show the economy is growing across Washington state. 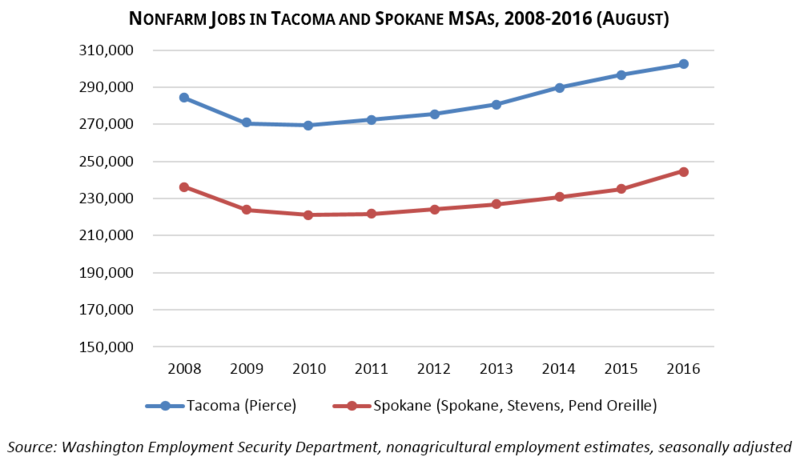 Employment markets from Spokane to Longview have experienced several years of job growth. 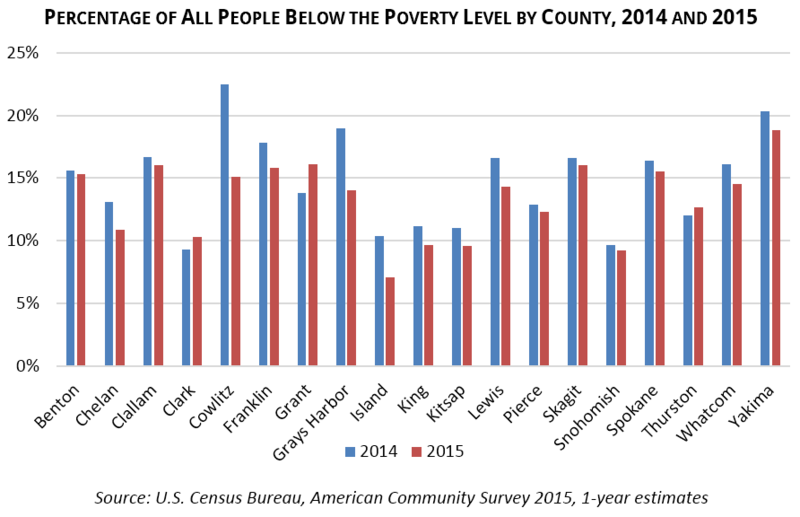 In most counties, typical household incomes are also up, while poverty rates are down. But the news is not all good. Across the state, costs for housing and other basics have risen dramatically. Because general inflation has been low and Washington’s minimum wage is tied to the Consumer Price Index, the statewide minimum wage did not go up at all in 2016 and is slated to increase only 6 cents to $9.53 in 2017. These factors make the initiative to raise Washington’s minimum wage in four stages to $13.50 in 2020 and include paid sick and safe leave as a basic labor standard particularly well-timed. 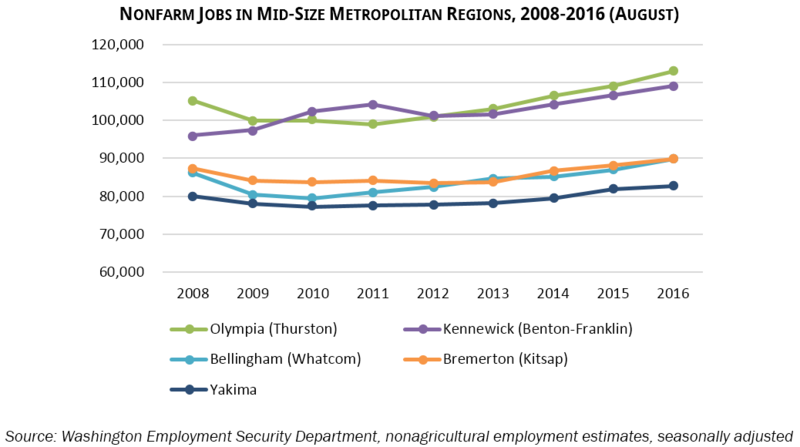 All of Washington’s large and mid-sized urban areas are gaining jobs and have more jobs now than before the Great Recession began in late 2008. 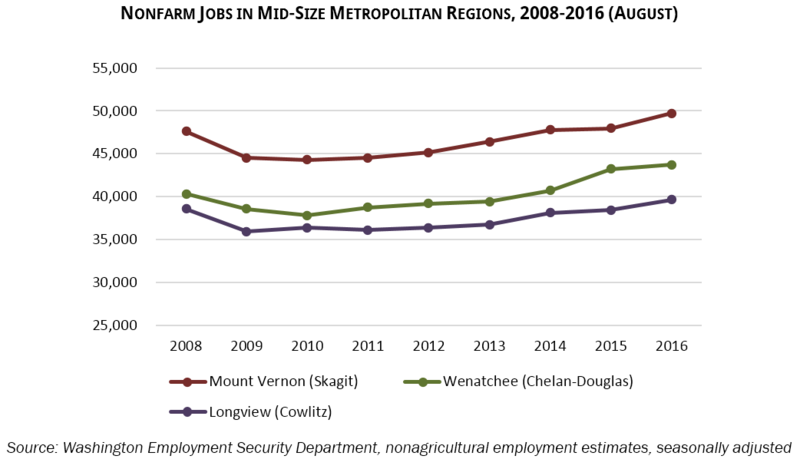 Smaller communities, such as the Port Angeles area and Lewis County, are below the 2008 level, but for the most part have also seen an uptick in jobs in recent years. 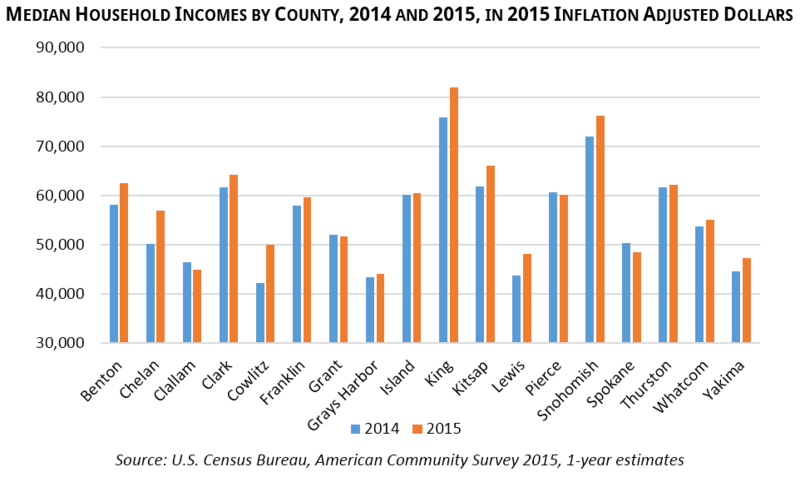 Newly released American Community Survey data from the U.S. Census Bureau show that the typical household in most counties in the state experienced real income growth between 2014 and 2015. Rates of health insurance coverage also rose in every county. Statewide health insurance coverage increased from 90.8% to 93.4%. 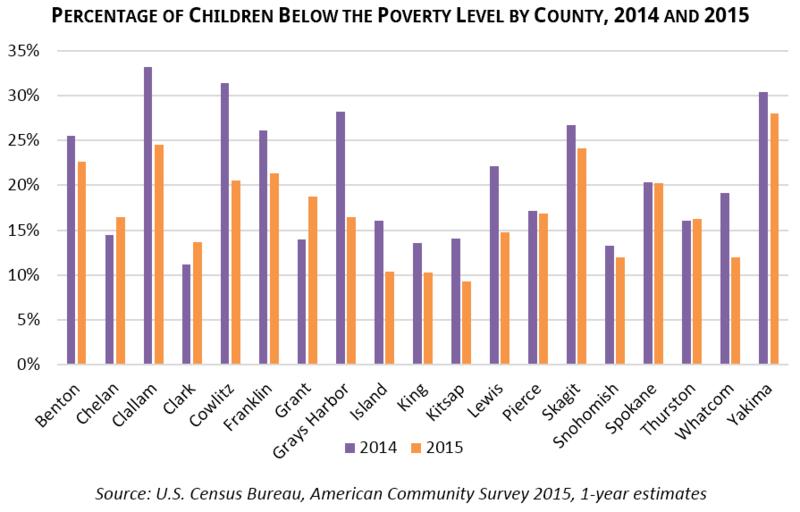 Meanwhile, the number of individuals and children living below the federal poverty level fell in most counties, in some cases dramatically. Not all the economic news is good. The top 25 occupations that are growing and are projected to have the most job openings over the next five years include computer-related and business jobs that usually come with high pay and full benefit packages, and family-wage jobs in construction and healthcare. However, the list also includes tens of thousands of positions in fast food, restaurants, retail sales, personal care, and office administration – where current wages often are not enough to support a single person, let alone a family. Many of these lower paying jobs also lack basic benefits including paid sick leave, adding to the level of economic insecurity. Basic expenses including rent have risen sharply faster than inflation in most parts of the state. 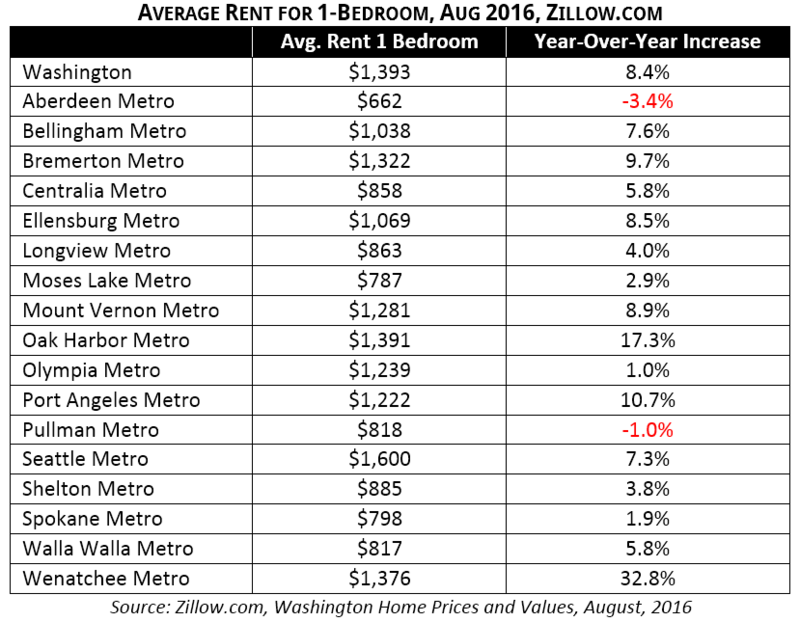 According to Zillow, the average rent for a 1-bedroom in Washington went up 8.4% from August 2015 to August 2016, with the largest gains outside the Seattle metro area. Only Aberdeen and Pullman posted modest declines. Childcare costs are also escalating out of reach. Washington now ranks 6th in the nation for least-affordable infant care costs. Average cost for infant care in Washington consumed 29% to 38% of median state earnings in 2014. Most states, like Washington, have diverse economic regions and include large cities, small towns, and rural communities. Over the past two decades, dozens of states have raised their minimum wages at different times. Economic studies consistently document higher earnings for low wage workers as a result, but have varied in their conclusions about whether or not raising wages impacts job growth. Typically, those studies that control for economic trends and differences among states and regions have found little to no impact on employment, while those that do not control for such differences often have found a small negative effect. Probably the most comprehensive study by Dube, Lester, and Reich in 2010 compared every pair of counties across state lines with different minimum wages over a sixteen-year period. They found on average no impact on the number of jobs in counties which had experienced a minimum wage increase. They also documented higher incomes and longer job tenures among low wage workers in counties with increased minimum wages. The reduction in costly turnover, increase in productivity, and increase in spending by low wage workers following a minimum wage hike help explain how employers are able to pay higher wages and maintain jobs with at most a modest increase in prices. The percentage increase proposed for Washington’s minimum wage under Initiative 1433 is well within the range of those included in these studies. Our modern economy is complex and will continue to have a mix of low, moderate, and high wage jobs. Over 90% of people working at or near minimum wage are adults, the majority contribute significantly to household income, and many are parents. People working hard in restaurants, retail shops, caring for vulnerable children and elderly people, and other traditionally low-wage occupations should be able to cover the basics. Raising Washington’s minimum wage and assuring that people do not lose income because of illness are long overdue in every part of the state. Washington Department of Labor and Industries, News Release: “Minimum wage in Washington to increase 6 cents in 2017,” Sep 28, 2016, http://www.lni.wa.gov/News/2016/pr160928a.asp. 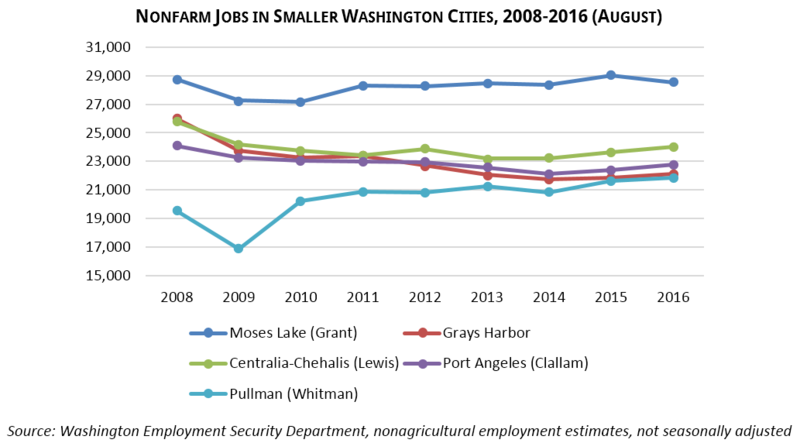 Comparing August nonagricultural wage and salary historical employment estimates, seasonally adjusted for metropolitan areas and not seasonally adjusted for smaller counties, Washington Employment Security Department website viewed Sep 30, 2016, https://esd.wa.gov/labormarketinfo/employment-estimates. U.S. Census Bureau, American Community Survey, 2015 1-year estimates, comparative tables. 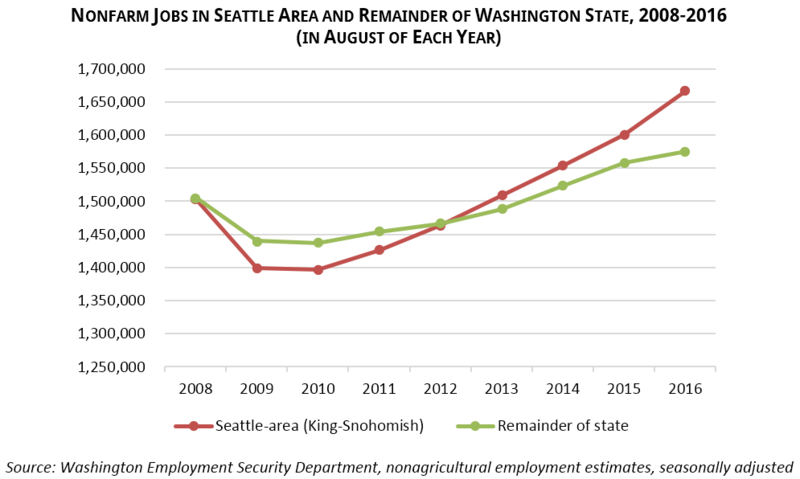 Washington Employment Security Department, Employment Projections, https://fortress.wa.gov/esd/employmentdata/reports-publications/industry-reports/employment-projections; and “Occupational Employment and Wage Estimates,” https://fortress.wa.gov/esd/employmentdata/reports-publications/occupational-reports/occupational-employment-and-wage-estimates. U.S. Bureau of Labor Statistics, Employee Benefits Survey 2015, Table 32, http://www.bls.gov/ncs/ebs/benefits/2015/ownership/private/table32a.pdf. Zillow.com, Washington Home Prices and Values (August 2016), viewed Oct 4, 2016. Child Care Aware of Washington, “Washington’s Child Care Costs Are Among The Highest In The Nation, According To Child Care Aware Of America’s Annual High Cost Of Child Care Report,” press release December 2015, http://wa.childcareaware.org/news/2015-high-cost-of-child-care-press-release. Economic Opportunity Institute analysis of Child Care Aware of Washington and U.S. Census Bureau American Community Survey 2014 data. Daniel Kuehn, “The Importance of Study Design in the Minimum Wage Debate,” Economic Policy Institute, Sep. 2014, http://www.epi.org/publication/importance-study-design-minimum-wage-debate/. Arindrajit Dube, T. William Lester, and Michael Reich, “Minimum Wage Effects Across State Borders: Estimates Using Contiguous Counties,“The Review of Economics and Statistics, November 2010,http://www.mitpressjournals.org/doi/abs/10.1162/REST_a_00039. John Schmitt, “Why does the minimum wage have no discernible effect on employment?” Center for Economic and Policy Research, Feb 2013, http://cepr.net/documents/publications/min-wage-2013-02.pdf. U.S. Department of Labor, “Changes In Basic Minimum Wages In Non-Farm Employment Under State Law: Selected Years 1968 to 2016,” viewed Oct 13, 2016, https://www.dol.gov/whd/state/stateMinWageHis.htm. Washington Budget and Policy Center, “Raising Minimum Wage Frequently Asked Questions,” Jan 2016, http://budgetandpolicy.org/2016_Jan_4_Minimum%20Wage%20QA.pdf; and Economic Policy Institute, State Tables: Characteristics of workers who would be affected by increasing the federal minimum wage to $12 by 2020, 2015, http://www.epi.org/files/2015/revised-minimum-wage-state-tables.pdf.